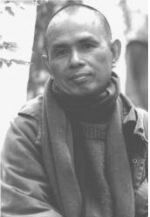 This is a brief meditation on the Buddhist teaching of “inter-being.” Within the nondual awareness cultivated in Buddhism, especially the Zen Buddhism taught by Thich Nhat Hanh, nothing exists separately of everything else. Everything, ourselves included, is recognized as being a meeting point of shifting forces, environment, time, and perception. It is only in that touching, that interaction, that forms arise and individuals are said to exist. Remove those forces, and individual beings and objects cannot exist. In this sense, as individuals we are not spots that occupy space on the blank field of creation, rather we are empty spaces that are only suggested by the confluence of various forces. Discover that empty space, and you discover the eternal, blissful Void that is the true Self — void of form and “thingness,” but filled with life and awareness. By cultivating pure and compassionate awareness within ourselves, we transform those who perceive us, for their perception of us is a part of what they are composed of. And the more we “transform the garbage” in ourselves, the less that garbage shows up in those around us. In this way of inter-being, the more we discover peace, the more we offer peace; the more we find joy, the more we bring joy. and you let me be me. and they let us be free. Thank you, Arlene, for your lovely, heart-felt note. A beautiful way you phrased that — being exhausted as one of your spiritual practices. While donations are hugely appreciated, please never feel that you should send more than you can comfortably afford. Thank you — and much love. Could this have been my “inter-are”? that me that won’t judge you. hopefully that you, that will not judge me. of ‘Abram and Lot’ and their quarreling herdsmen.